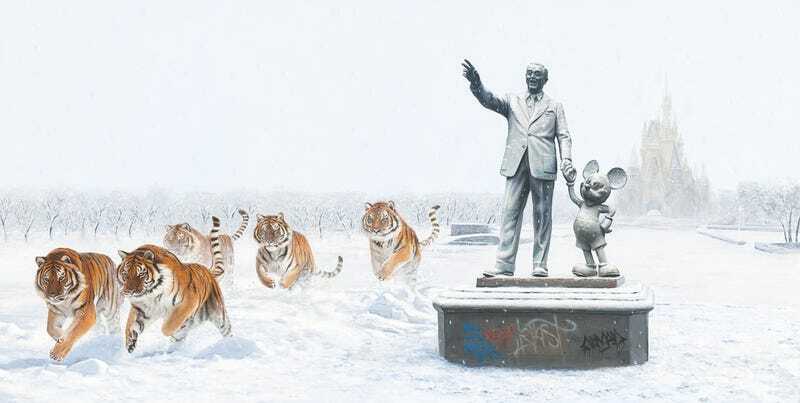 Orlando looks very different in the hands of artist Josh Keyes, whose surreal post-apocalyptic scenes we’ve ogled before. This and five other new works by Keyes are currently on display at Antler Gallery & Store in Portland, Oregon. Antler’s “Reclamation of Nowhere” show features new works by Keyes and artist Brin Levinson. You can see more of Keyes’ work on both Antler and his own website. “A Whole New World” is featured with the artist’s permission and was spotted via mashKULTURE.